Hi im Lohith,im studying in christ college of science and management. in my college im going to take seminar on this laser communication,so im perfering this website could help with these topic.i need help.please help me. This laser communication system transmits sound or music signals through a laser beam. The intensity of the laser beam changes with the amplitude of the sound signal. The variation in the intensity of the laser beam becomes a variation in the voltage level using the solar panel of a calculator. 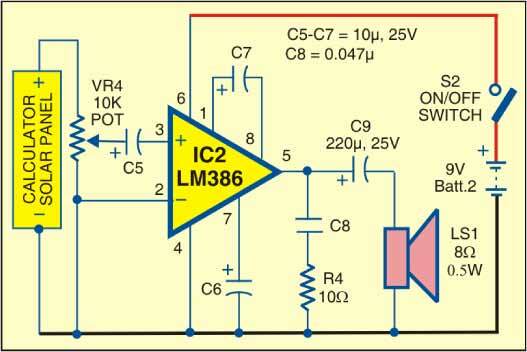 The voltage variation in the solar panel is amplified by a LM386 low-voltage audio power amplifier and reproduced by a loudspeaker. 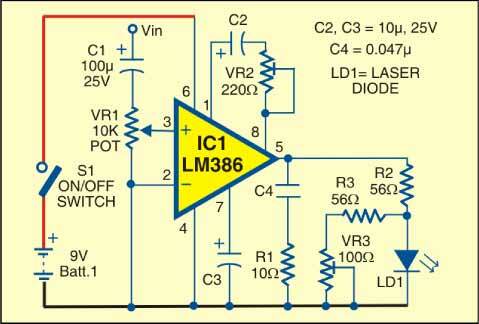 The maximum output of the LM386 audio amplifier is 1 watt, while its voltage gain is 20-200. The circuit consists of a transmitter and a receiver. Both transmitter and receiver are built around the LM386 IC, powered by a 9V battery. Figure 1 shows the transmitter circuit. Here a laser diode (LD1) is used with maximum operating voltage of about 2.6V DC and maximum operating current of 45mA to transmit the audio signal. The voltage divider network formed by R2, R3 and VR3 maintains the voltage as well as the current for the laser diode in the safe region. Instead of the laser diode, you can also use a laser pointer. Remove the battery from the laser pointer. Extend two cables from the LD1 terminals and connect them to the terminals of the battery of the laser pointer. The spring inside the laser pointer is the negative terminal. The output power of the laser pointer is 5 mW. Be careful when working with lasers, as direct exposure to the laser beam can be dangerous to the eyes. Aim the laser beam towards the solar panel. The VR1 potentiometer (10 kilo-ohms) is used to change the level of the input audio signal. The audio input (Vin) is taken from the preamp output of the music system (CD player, DVD player, etc.). The capacitor C2 and the preset VR2 are used to vary the gain of the LM386. Figure 2 shows the receiver circuit. The audio signal transmitted by the laser diode (LD1) is received by the solar panel of the calculator and amplified by IC2. The gain of the amplifier is fixed by the capacitor C7. Preset VR4 is used to change the signal level from the solar panel. This signal is fed to the input pin 3 of IC2 through the coupling capacitor C5 so that the DC value of the solar panel can be eliminated. The amplified output of IC2 is fed to the speaker, which plays the music from the CD player connected to the input (Vin) of IC1. Mount the transmitter and receiver circuits in separate printed circuit boards and place them in suitable enclosures. In the transmitter cabinet, attach two terminals to connect the audio signal. Set the S1 switch on the front panel and the laser diode (LD1 or laser pointer) on the back of the cabinet. Keep the 9V battery inside the cabinet. In the receiver cabinet, attach the solar panel of the calculator to the back so that the transmitted beam falls directly on it. Set the S2 switch on the front panel and the speaker on the rear. 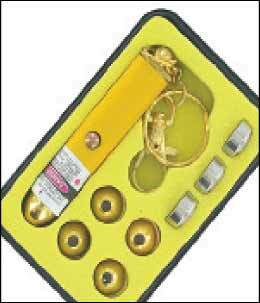 Keep the 9V battery inside the cabinet. Refer to Figures 3 and 4 for the calculator's laser pointer and solar panel. After mounting both circuits, orient the laser diode (or laser pointer) so that the transmitted laser beam falls directly on the solar panel. 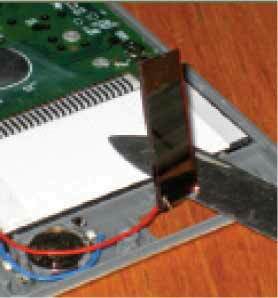 Use shielded cables to connect to the audio input and to the solar panel to reduce noise pickup.